Sharp Concrete Cutters and Drillers provides a complete concrete cutting and drilling service. Sharp Concrete Cutters and Drillers was established in the early 2000’s bringing together a handful of highly experienced concrete cutting and drilling technicians. Since then, Sharp Concrete Cutters and Drillers have provided concrete cutting and drilling services on thousands of projects not only across Auckland but across the country. In the aftermath of the Canterbury Earthquake, Sharp Concrete Cutters and Drillers sent one of its top concrete cutting and drilling technicians to Christchurch to assist with various aspects of the rebuild. Sharp Concrete Cutters and Drillers offers its concrete cutting and drilling services to an ever expanding service delivery area. On a given day their technicians can be found cutting and drilling concrete on either side of the Bombay Hills and either side of the Harbour Bridge. Their team is mobile and live in various parts of Auckland and Franklin. This means that no matter where your project is, a member of their team can be on site, on time, helping you to realise your project goals on time and on budget. 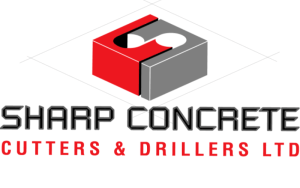 Sharp Concrete Cutters and Drillers seeks to always be on the cutting edge when it comes to concrete cutting and drilling technology and employees only the highest quality diamond blade and core drill technology designed especially for New Zealand conditions. Additionally, each technician is equipped with high powered cutting and drilling equipment from reliable manufacturers such as Husqvarna and Stihl and diamond tool distributors such as Holer Diamond Tools and Chelsea Diamond Tools. Add to this the fact that Sharp Concrete Cutters and Drillers has an ‘in-house’ mechanic, and this ensures that each concrete cutting and drilling technician has the knowledge, experience, tools, and equipment to do the very best job every time, safely, efficiently, and on budget. Sharp Concrete Cutters and Drillers are committed to professionalism and accordingly are members of national and international organisations to ensure customers that their technicians are part of a wider body of cutters and drillers. This helps them to stay on the cutting edge when it comes to technology and developments within the concrete cutting and drilling industry.